Sometimes when the world has gone mad, you just need the reassuring presence of The Big B dishing out dishoom and justice. Shiva and Aslam grow up besties in one of those happily diverse communities. Their dads are also friends, teasing each other about being rubbish at being a Muslim or a Hindu because they can’t even remember their own religious celebrations. 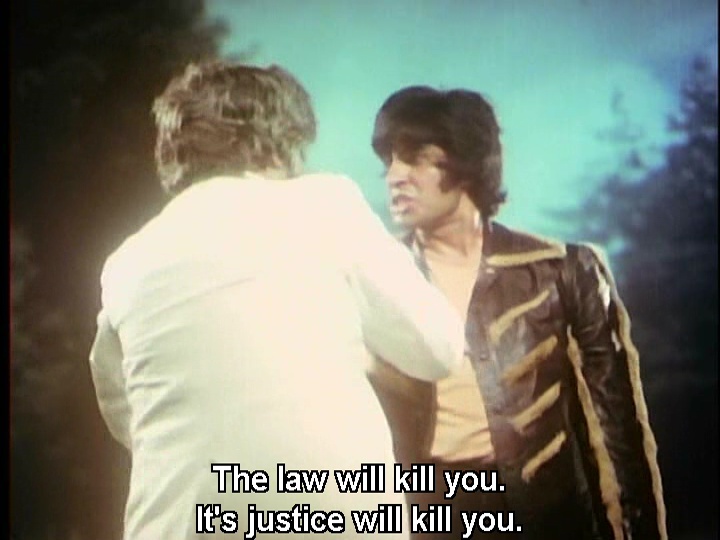 Both dads make a powerful enemy when they stop a flamboyantly bewigged and fringed Kader Khan killing a bloke. 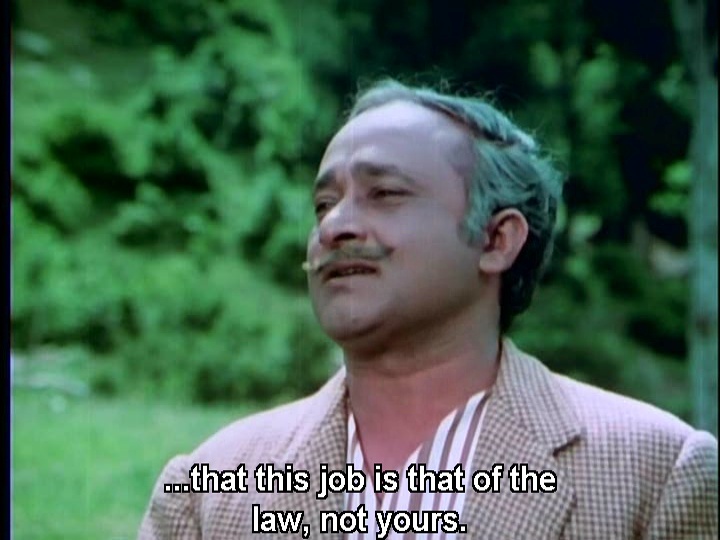 He decides to foment communal strife in order to kill them without the police suspecting him, and somehow this is linked via a montage to Partition. 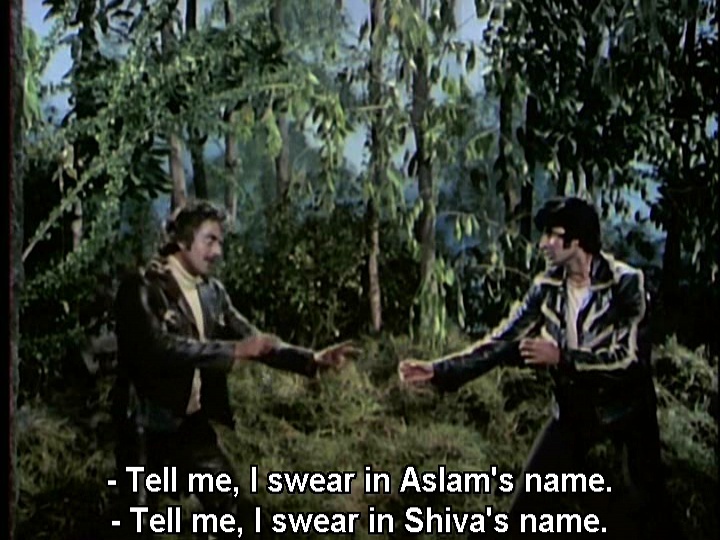 The family is torn apart by a house fire that kills Ram and Rahim, leaves Aslam lost, and places young Shiva with Aslam’s ma (Nirupa Roy) as his only family. 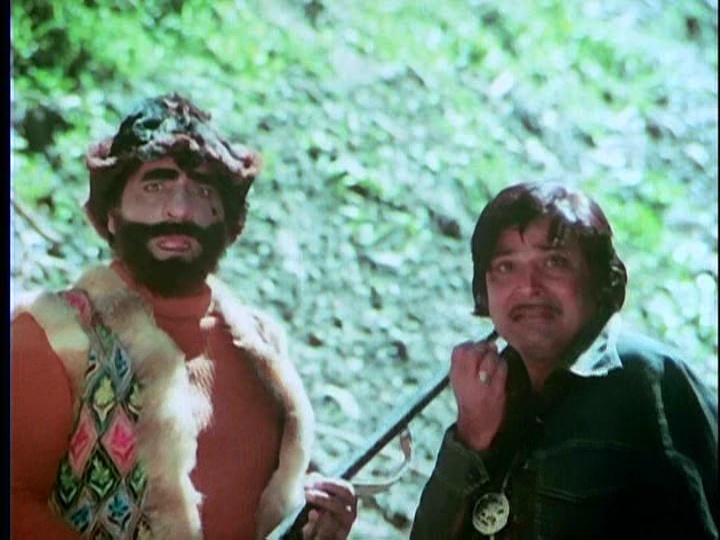 The kids are indifferent actors, probably chosen for their evolutionary potential to end up looking like neighbourhood thug Shiva, aka Tiger (Amitabh Bachchan), and principled dacoit Shera (Vinod Khanna). 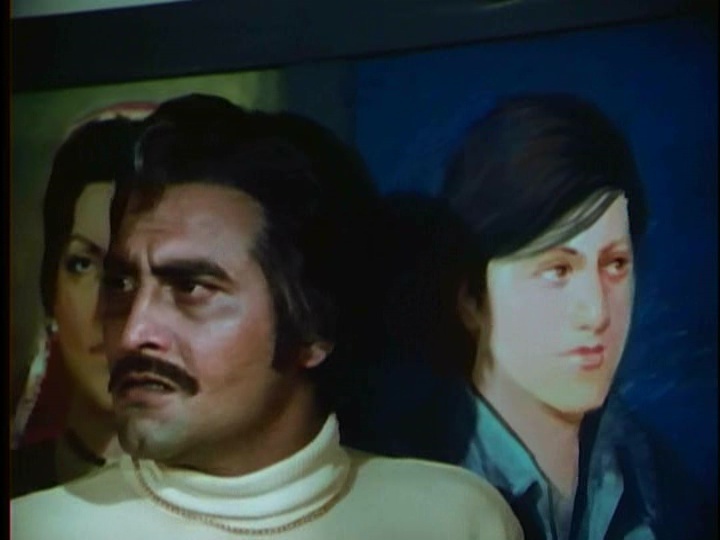 Tiger hasn’t forgotten his past despite being raised by Nirupa Roy while Shera is trying to find death, but even death is worried by his body count. 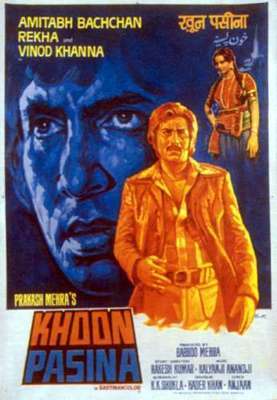 Amitabh gets the best and worst of the film. Shiva/Tiger is an impulsive thug who is motivated by the right reasons but doesn’t stop to think about collateral damage or even just stop to think, a dictator in his own manner. 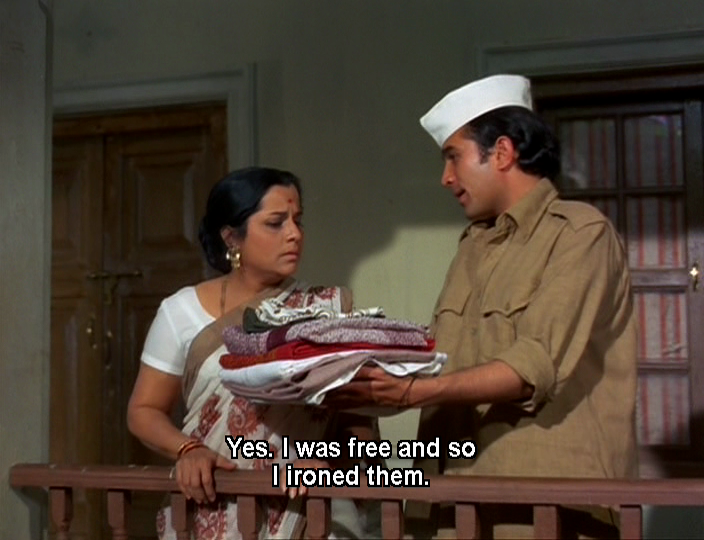 He also gets stuck with a wardrobe that I wish I could say was part of the comedy track. It annoys me so much that he is called Tiger yet wears leopard print. Really! 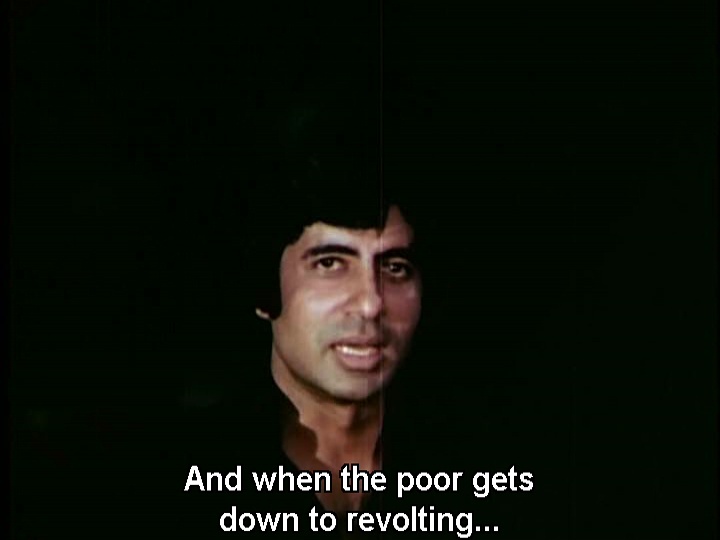 But Amitabh has such charm that the glib one-liners work a treat and he can switch effortlessly to show Shiva’s darker side. And some of the comedy track is funny despite itself. I particularly enjoyed the wedding party being entertained and fed by the crooks who had come to steal the bride. 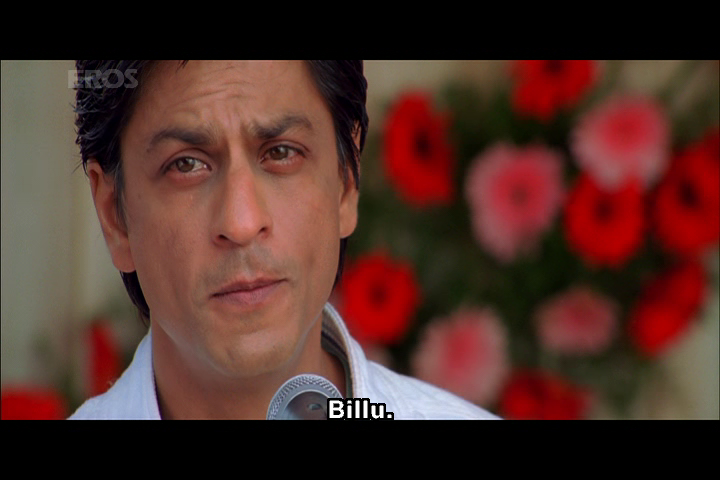 I suppose in a different film, Tiger could always have picked up work as an event planner. 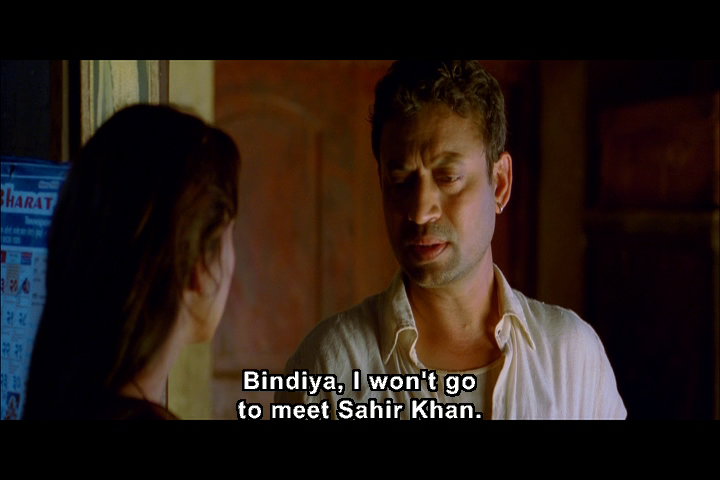 Tiger sees the curvaceous and feisty Chanda (Rekha) at the market and is smitten. She challenges him to back up his bragging by wrestling a tiger for her. So he does. 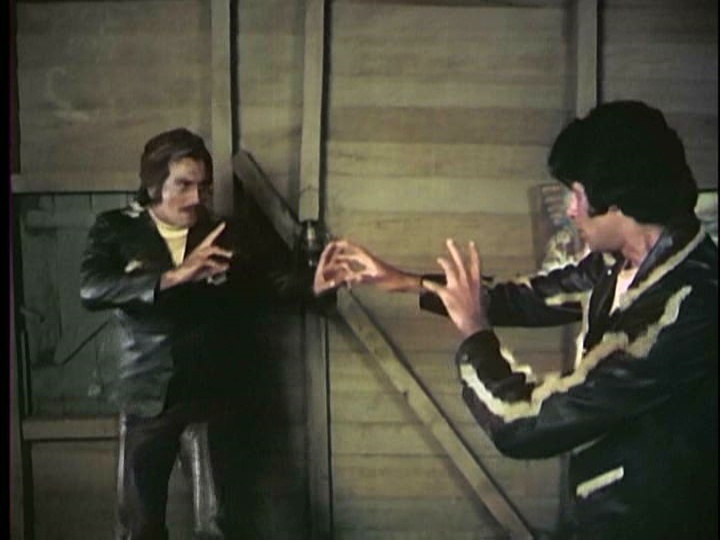 But Chanda has been engaged to gangster Raghu (Ranjeet) since childhood, and he is not inclined to give up his claim. 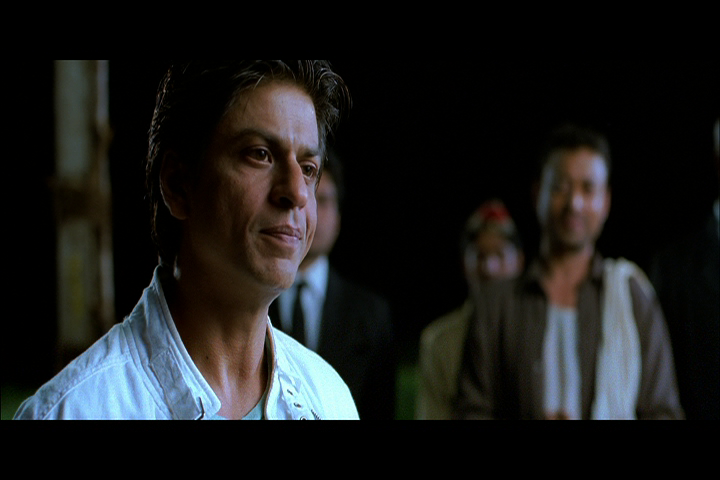 Raghu tries to get Shera to kill Tiger but Shera says it would be better if Raghu died. 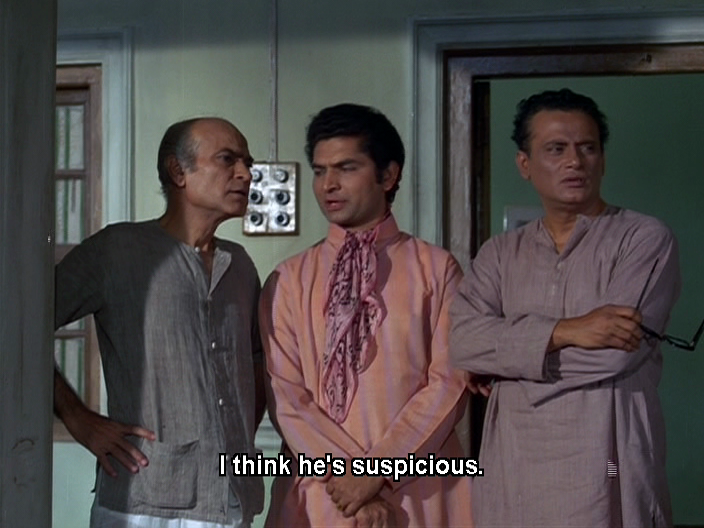 Raghu has other ideas and starts messing with Zaleem Singh who is still alive and scheming. Shera still mourns his lost family, and believes himself alone in the world. Like Shiva, he has a strong commitment to justice as he sees it, and like Shiva he doesn’t pay attention to the law. 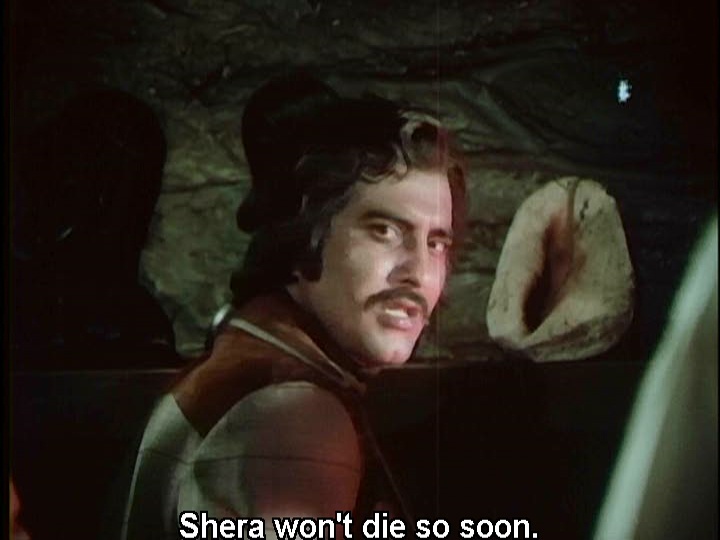 Vinod Khanna was saddled with some dodgy hair and a lot of pleather, but Shera is certainly the cooler of the grown up boys. Probably because he doesn’t have his mummy choosing his outfits. 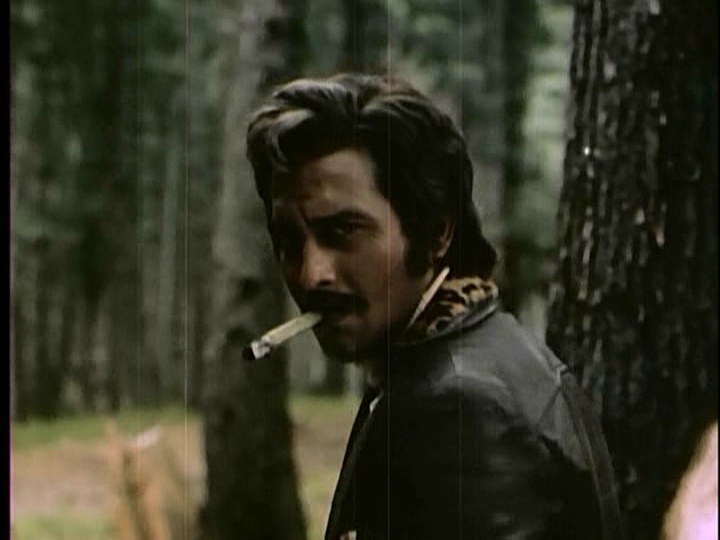 But he is also afflicted with the faux leopard trim. 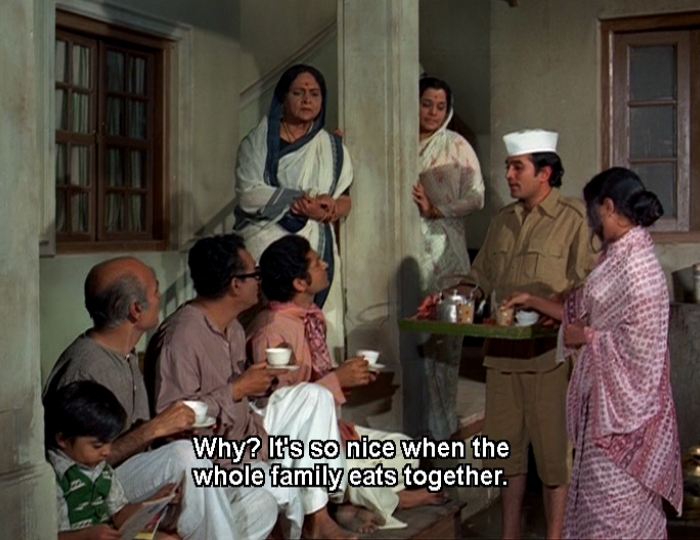 Vinod delivers his cheesy lines with a detached and weary cynicism threaded with sentimentality about families and honour. It’s the kind of role that I usually expect to see Danny Denzongpa in and I think he might have added a little more spark to the pathos. The long lost friends spend almost all the film apart and their few scenes together are good. I wish they had interacted a bit more to ramp up the tension a bit. Chanda faces Raghu down with the full support of her father who says she cannot be married off against her will. Hurrah for that dad! 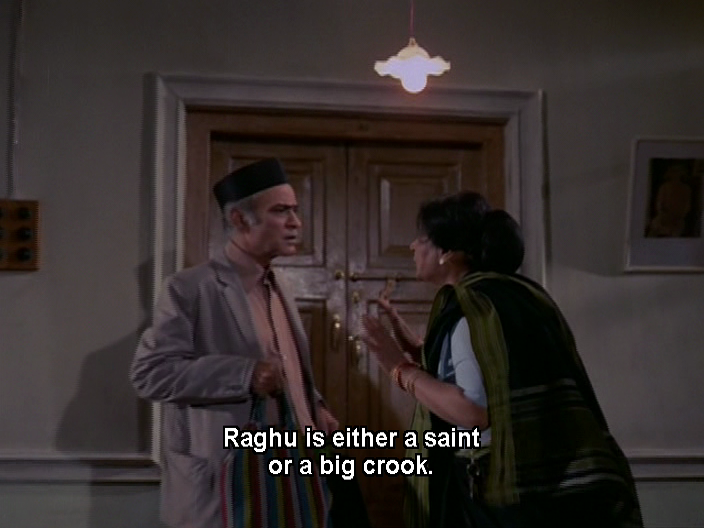 Naturally Raghu decides to eliminate Tiger, but being a weasel he takes many indirect routes rather than simple confrontation. 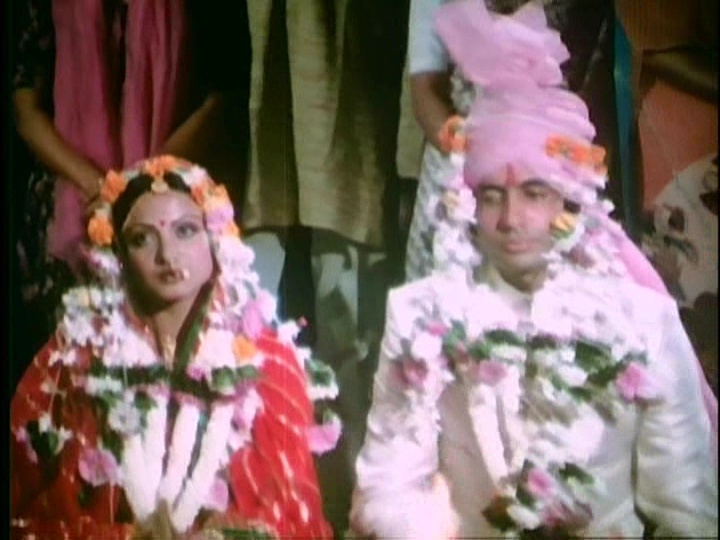 Rekha’s body language is quite masculine and often aggressive in Chanda’s pre-marriage scenes. She owns her space and doesn’t let unwanted contact go past without payback. She falls for Tiger but then he plays hard to get. They have a push and pull in their dynamic that is amusing but not emotionally healthy. 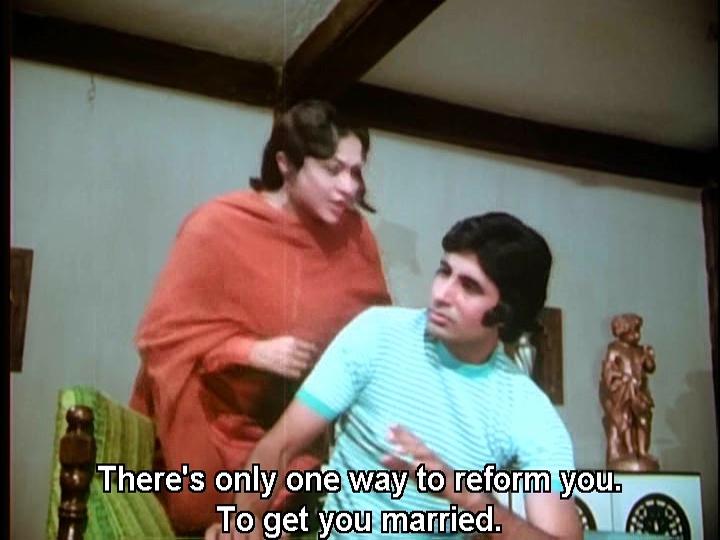 And when it comes to Tiger choosing between his wife or his ma, you’d better believe he is a mummy’s boy who will slap his wife into the middle of next week if she disagrees with Ma. 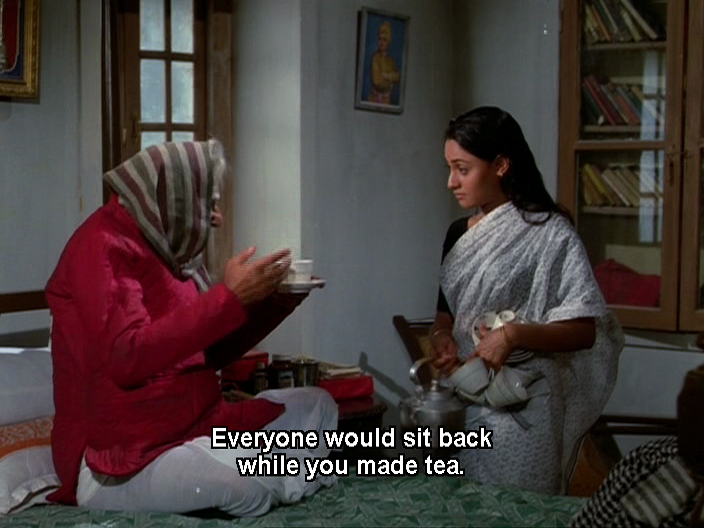 Rekha and Amitabh have that chemistry of course, but I enjoyed Chanda’s scenes where she was going about her daily routine alone and her interactions with other people in the village. 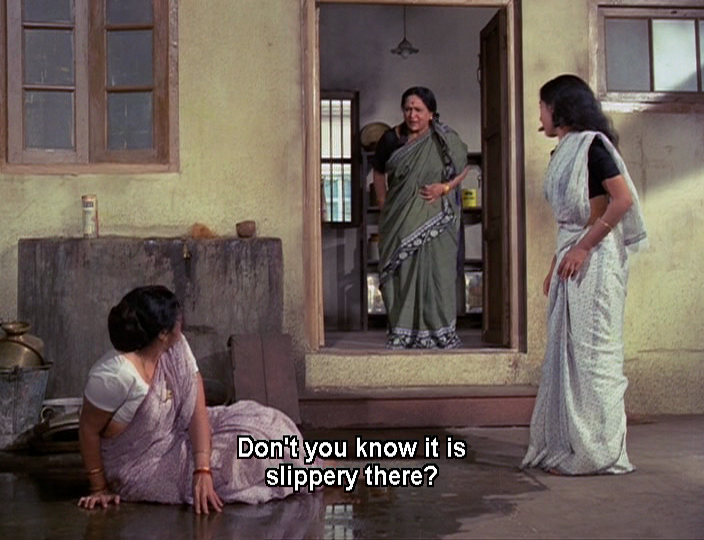 Rekha can be funny as well as dramatic, and despite a few airhead moments Chanda is quick-witted and interesting. 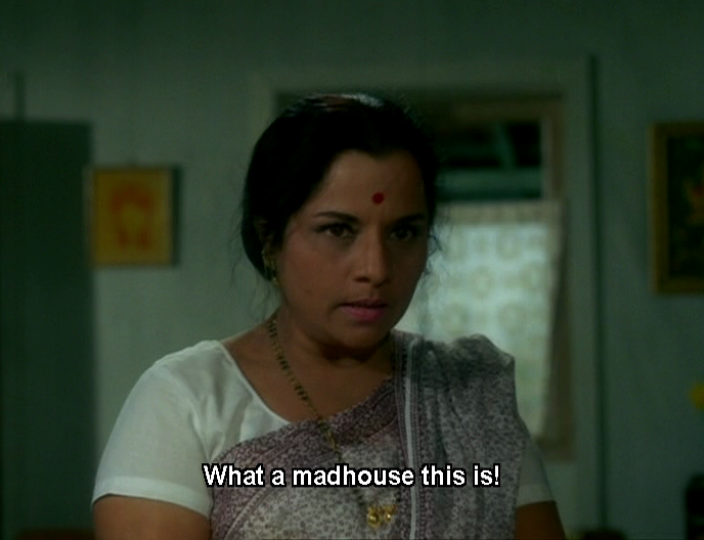 Shanno or Shantidevi (Aruna Irani) is another defiant woman. She loves her husband Mohan (a very restrained Asrani) who is a gentle, law abiding man and they talk about their conflicting beliefs and all seems really respectful and solid. 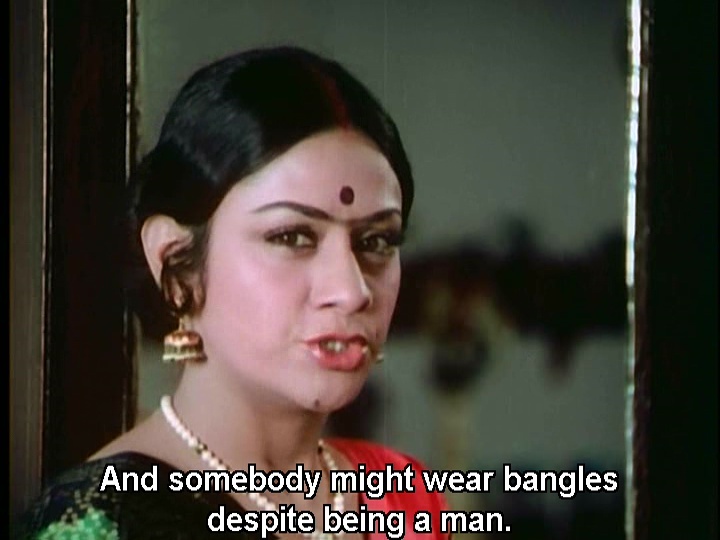 Except when Mohan is threatening Shanno to prevent her from telling her brothers or when Shanno is telling Mohan to pop on some bangles and let her be the man of the family. Shanno also happens to be Zaleem Singh’s daughter and bears her Monobrow of Fury with elan. Her immediate reaction to any insult is to grab a gun and try and kill the offender, saying her brothers will clean up the legal issues. 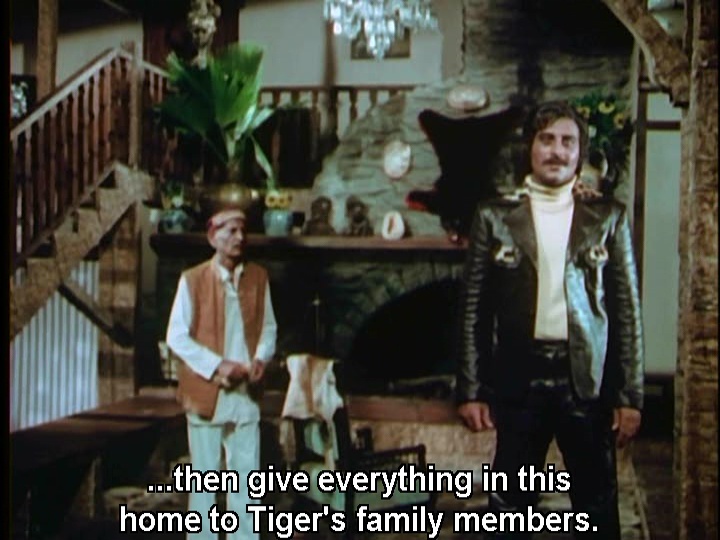 When Raghu burns down their farm and pretends he is Tiger, it sets up yet another conflict. 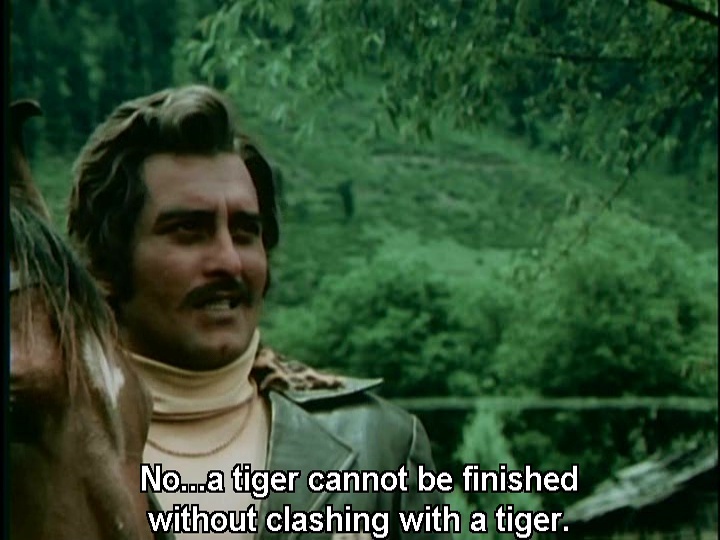 After a tense family visit, and a huge random edit, Mohan decides to go kill Tiger so Shanti also runs off after him with a gun. 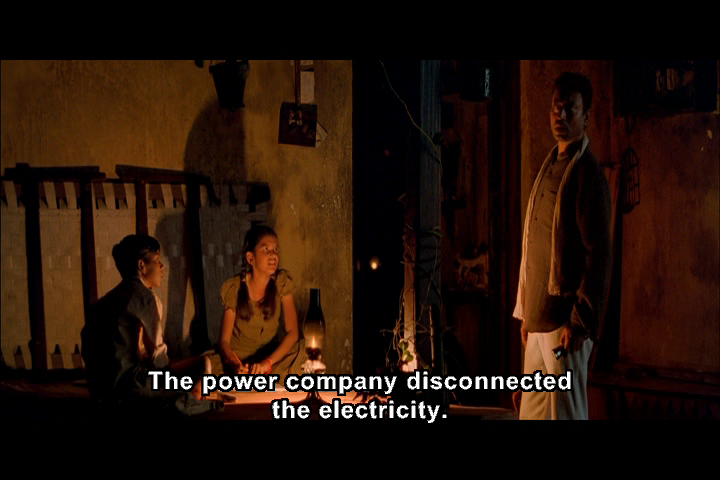 Shiva relocates to the jungle and ends up working on a plantation owned by Zaleem Singh. 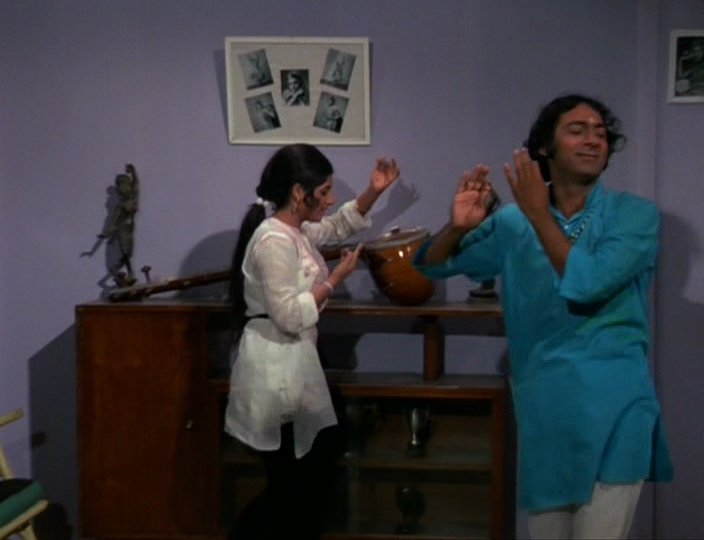 He gets a nice Kalyanji-Anandji number that looks like a rehearsal for Mr Natwarlal, and Helen makes an appearance to dance for the landlords. He builds new relationships and becomes the voice of workers’ rights and social justice. There’s even an “I’m Spartacus” scene. 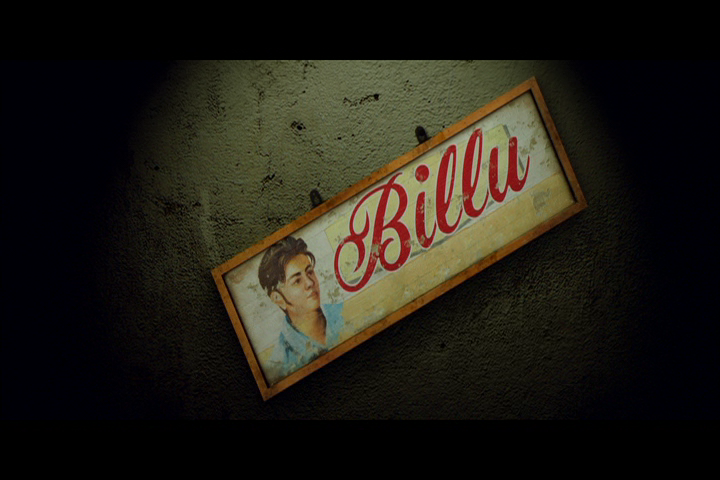 Chanda is gradually sidelined but she remains a strong force in the film and in Shiva’s life. 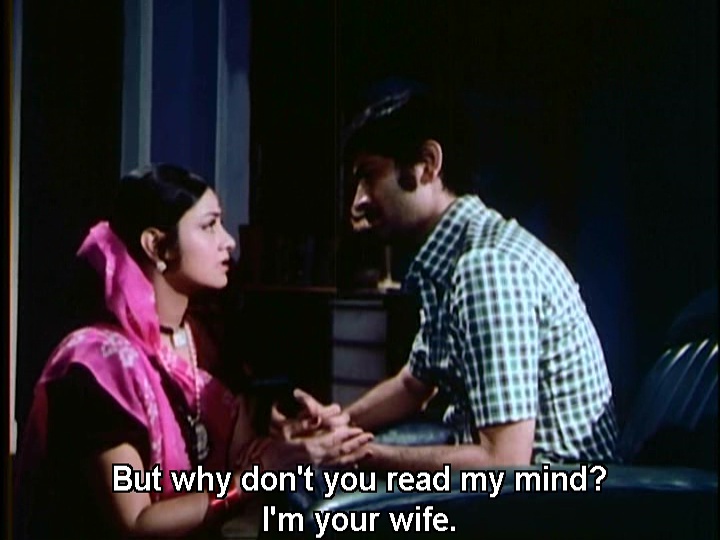 Nirupa continues to give him pointless and conflicting instructions. The lack of emotional blackmail opportunities drives her to almost commit a crime so she can stop herself and “Nahiiiiin!” about it. There are so many bad guys! 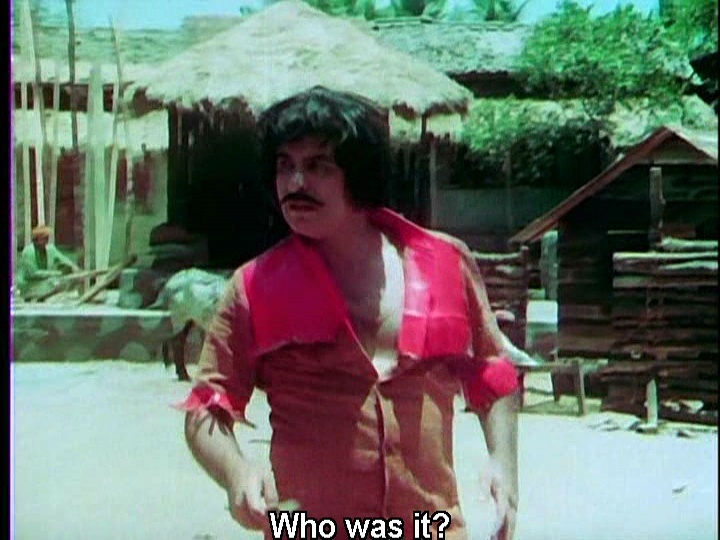 Ranjeet gets his shirt off for no reason, Kader Khan is slimy and arrogant as Zaleem Singh, Mac Mohan is natty in pleather as Singh’s flunkey, Vinod Khanna is a cut above this material, and there are so many beefy shirtless dudes running around beating people up that I suspect that was the main industry for the village. There are also abundant good guys, many of whom speak with sense, logic, and empathy. It’s quite pleasing to have some good life advice doled out to the hero. And all the while Shera is on Tiger’s trail, paid to hand Tiger over to Zaleem Singh but not really believing that he is a miscreant. What happens next? Please, you already know. 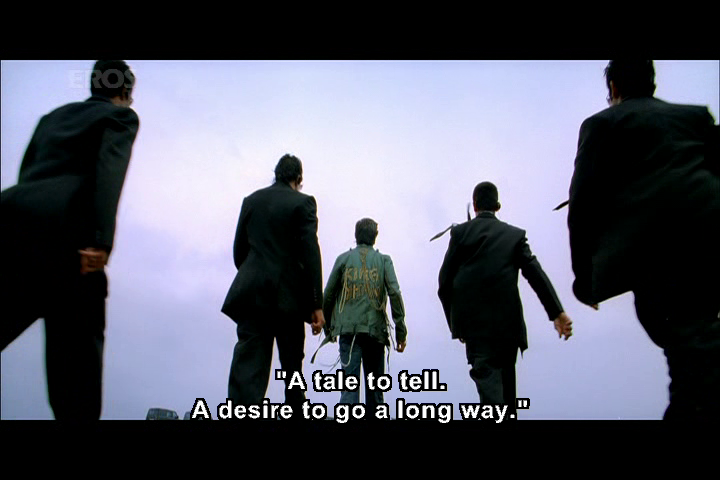 And yet there is always that bit extra that makes you go “Huh?” The action scenes are woeful as I don’t think Rakesh Kumar had the faintest idea of how to shoot or stage a fight so there is minimal choreography of the stunts and lots of bizarre angles and edits to skip over the lack of detail. There is a very long and quite unnecessary horse chase, although it did prove Moti knew what was what. It’s the kind of film where wallowing in quicksand is not enough, you have to simultaneously wrestle a snake. It’s the kind of film where if you want to kill someone you have to first build an enormous wooden edifice and tie them to a stake at the top. 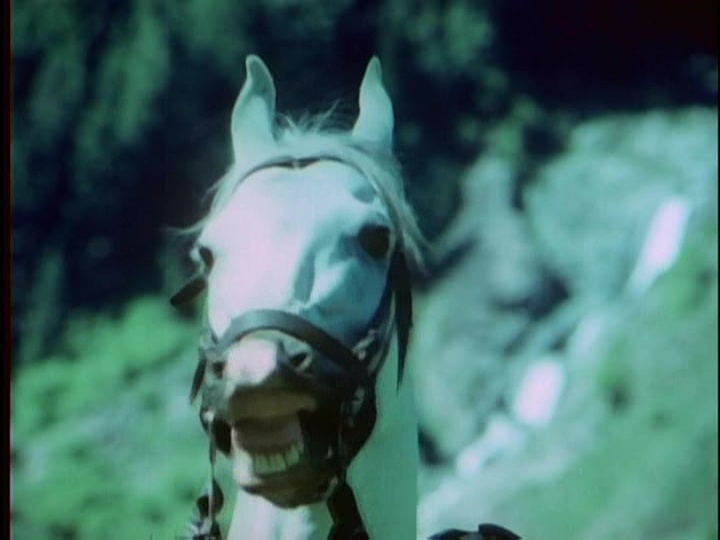 It’s the kind of film where Moti the horse should have been making key decisions. Despite being quite slapdash, the story contains some interesting little bits and pieces. 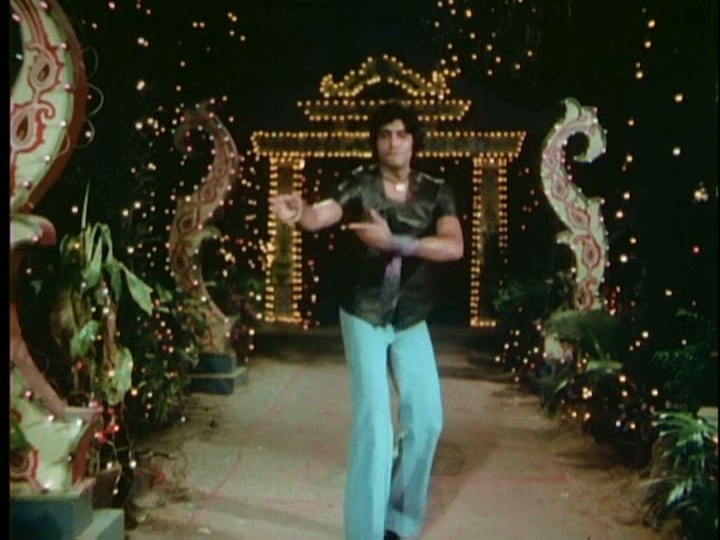 See it for Amitabh and Vinod emoting fiercely with Rekha and Aruna Irani being fierce. 3 ½ stars! 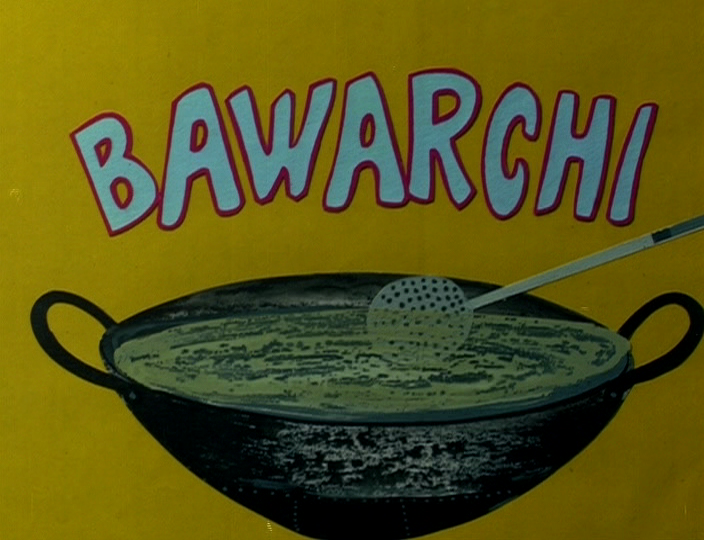 Bawarchi is simply a charming film and one that always makes me smile, even though it’s heavy on moralistic aphorisms and homely words of wisdom. 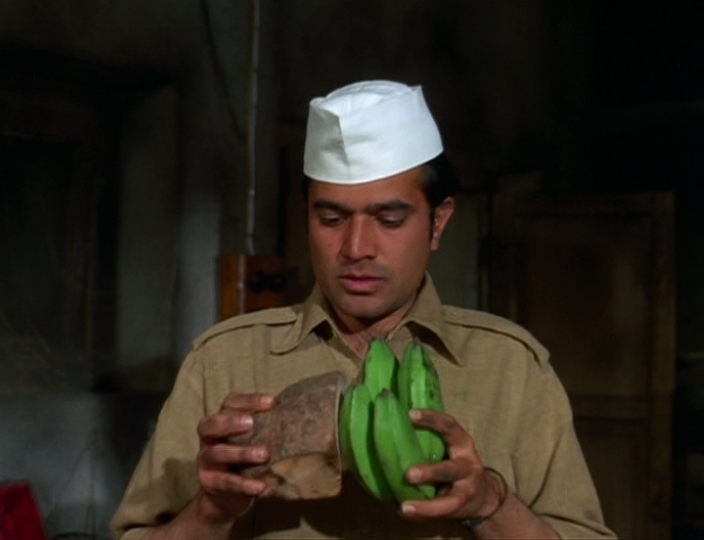 Rajesh Khanna plays the cook who takes on the task of transforming a dysfunctional and argumentative family with his simple outlook on life; although there are numerous hints throughout that he may not be quite what he seems. The strengths of the film are the all-star cast who all fit into their roles perfectly and Gulzar’s well written dialogues that ensure the petty family disagreements are realistic and believable. 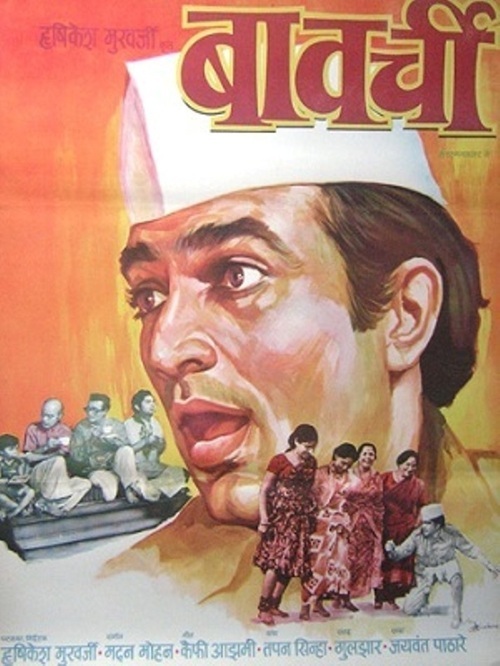 Hrishikesh Mukherjee’s screenplay is based on Tapan Sinha’s 1966 Bengali film Galpa Holeo Satyi and Sinha is credited as the writer for Bawarchi. For anyone trying to track them down, both films are available on Youtube, although sadly the original Bengali film seems to only be available without subtitles. The story revolves around the household’s transformation from an unhappy and argumentative group of people to a caring and considerate family. Along the way there are songs, a dance competition and even a romance thrown in for good measure. 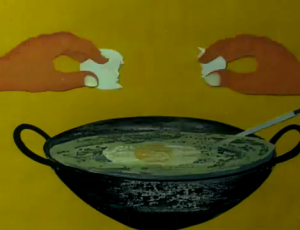 I love the opening graphics which use the cooking theme to good effect, but there are only a few before Amitabh Bachchan takes over, announcing the credits against a rather oddly static red curtain, and carries on with a voice-over introducing the various characters in the drama. Firstly there are the fractious Sharma family members who live in the ironically named Shanti Niwas. The never-ending conflict in the house means that the family cannot keep their servants, which in turn leads to further discord and argument. As the story opens the family are in the process of losing their last servant – the family cook – who has decided to move on despite his new job paying less. 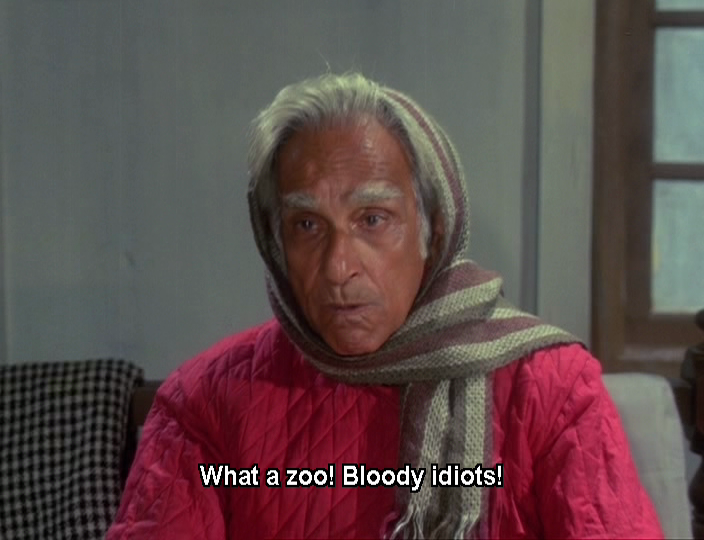 The family is ruled by the ageing patriarch Shivnath Sharma (Harindranath Chattopadhyay) who complains about his sons, his daughters-in-law and the lack of a decent cup of tea in the morning. 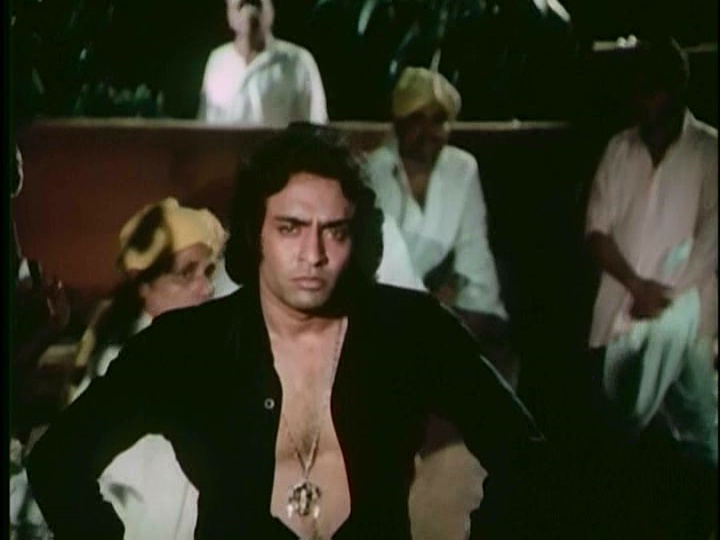 Despite his grumpy demeanour he is the only person in the house to think about the welfare of his late second son’s orphaned daughter Krishna (Jaya Bachchan as Jaya Badhuri). Harindranath Chattopadhyay is perfect here and his complaints are used to good effect to illustrate the trivial nature of most of the family disagreements. Krishna is at everyone’s beck and call, and yet she has a pleasant and sunny disposition which leads her to wait on everyone with a smile and not much thought of her own comfort. Just as well perhaps since no-one else thinks about her comfort at all. Also in the house are Shivnath’s eldest son Ramnath (A.K. 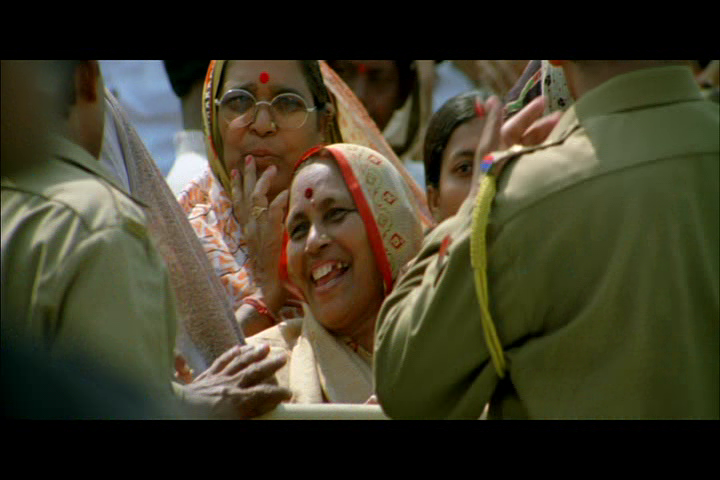 Hangal), his wife Seeta (Durga Khote) and their daughter Meera (Mansiha). 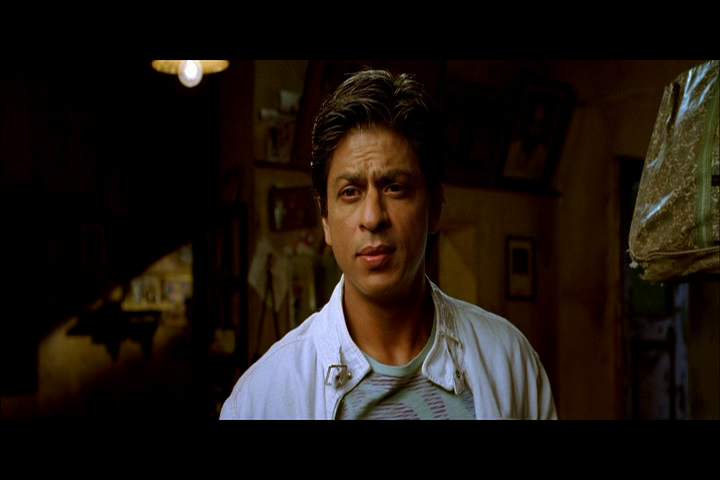 Ramnath is a harried clerk whose family life is impacting on his work. To combat his woes and possibly also to help him deal with his complaining wife and daughter he also drinks, although this actually makes him more pleasant to deal with, so perhaps it’s not entirely a bad thing. Seeta complains of her gout which makes her unable to help with the various household chores, while Meera is just plain lazy although she does get out of bed for her dance lessons. 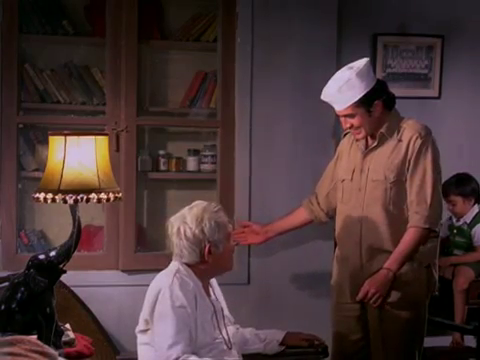 Shivnath’s third son Kashinath (Kali Banerjee) is a rather pompous school-teacher who lives in the house along with his wife Shobha (Usha Kiran) and their son Pintoo (Master Raju). The last member of the family is Shivanth’s youngest son Vishwanath (Asrani) aka Babbu, a music director for films who, as Krishna so aptly puts it, copies English songs, adds Hindi lyrics and records them. 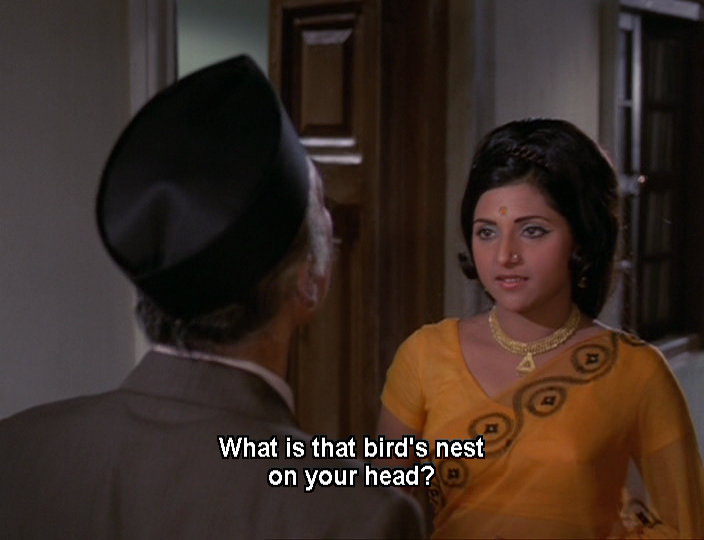 It’s just one of the examples of tongue-in-cheek poking fun at the Hindi film industry which Hrishikesh uses to add some more gentle comedy, almost as if he’s letting the audience into a big filmi secret, even as he himself still sticks to type of BW conventions he mocks during the film. 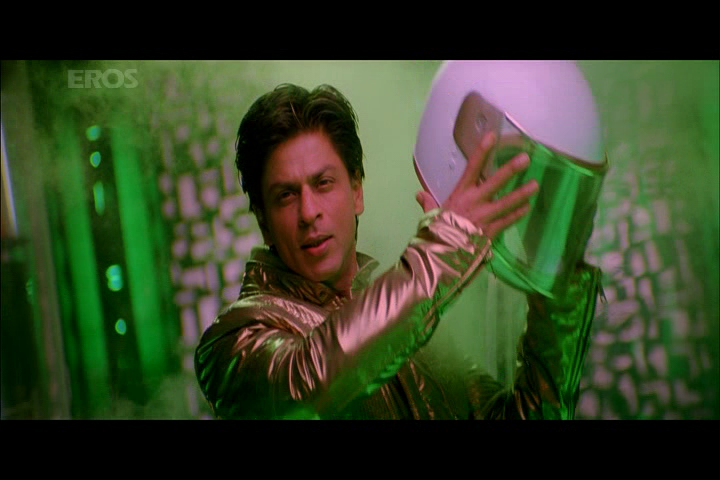 The final two characters in the drama are Meera’s dance teacher Guruji (Paintal) and Krishna’s tutor Arun. Arun is Krishna’s love interest but their romance is only a small part of the story, although it does become more important towards the rather clunky end of the film. The family squabbles are based on their own selfishness, and none of them wants to take on the responsibility of looking for new servants. 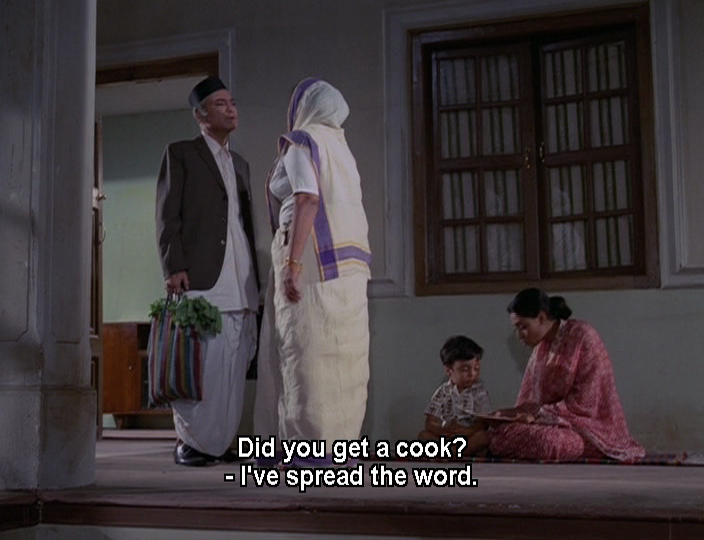 Into this unhappy household steps Raghu (Rajesh Khanna) who just appears on the doorstep one day volunteering to be their new cook. Raghu seems to be the answer to everyone’s prayers as he insists in a low salary, cooks amazing food and also has talents as a philosopher, singer, composer, and dance instructor to name but a few. 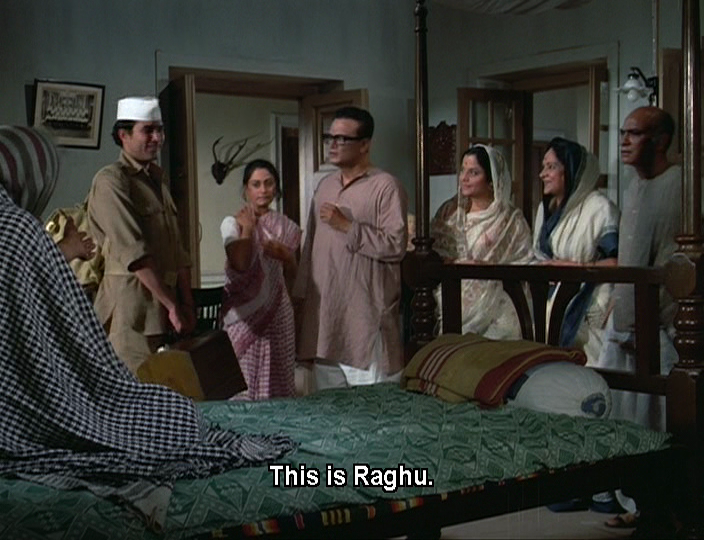 Raghu seems to be a gift from the gods as his unfailing happiness and good cheer start to have an impact on the family, as does his willingness to tackle even the most demeaning of tasks. This is a man who does the ironing – nothing else needs to be said! 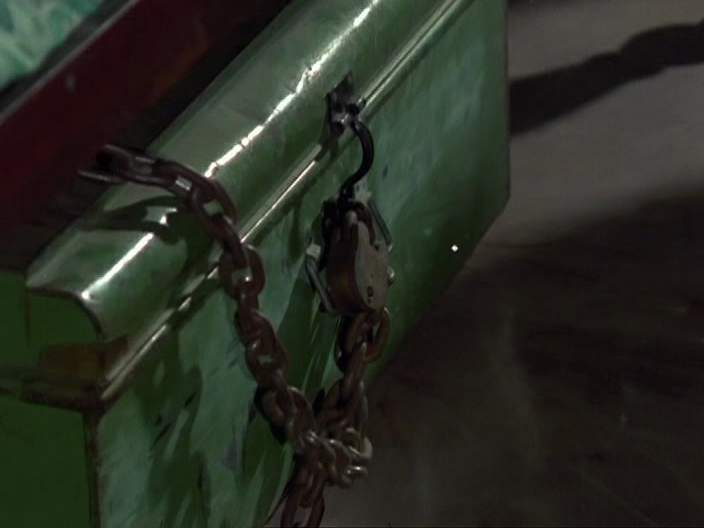 Raghu does however seem to have an unhealthy interest in the large box chained under Shivnath’s bed.This happens to contain the family jewels, and added in to reports of a thief in the area makes Raghu’s sudden arrival more than a little suspicious. However his ability to cook and his constant stream of knowledge about anything and everything soon make him indispensable to the family. 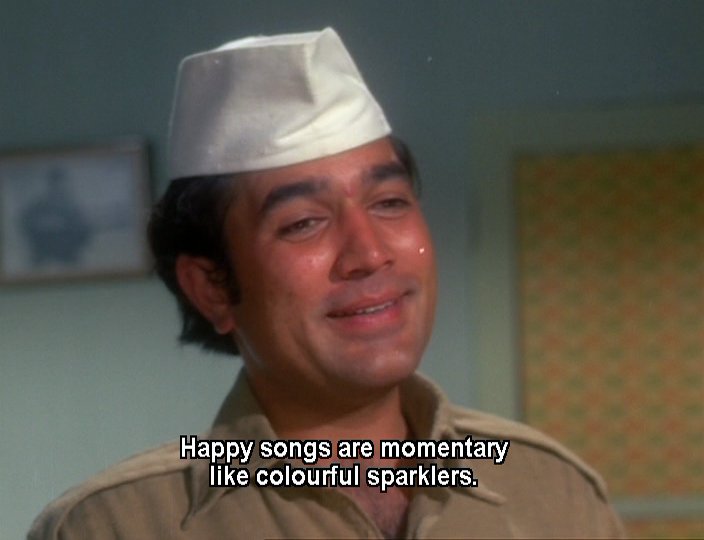 Rajesh Khanna plays Raghu as a cheerful and somewhat bossy servant and he uses this relaxed outspokenness to stop the stream of advice from becoming too preachy. Despite his constant chirpiness Rahgu never seems too sickly sweet to be true, something which is helped by the suspicion that he may in fact be a thief and is simply putting on an act. 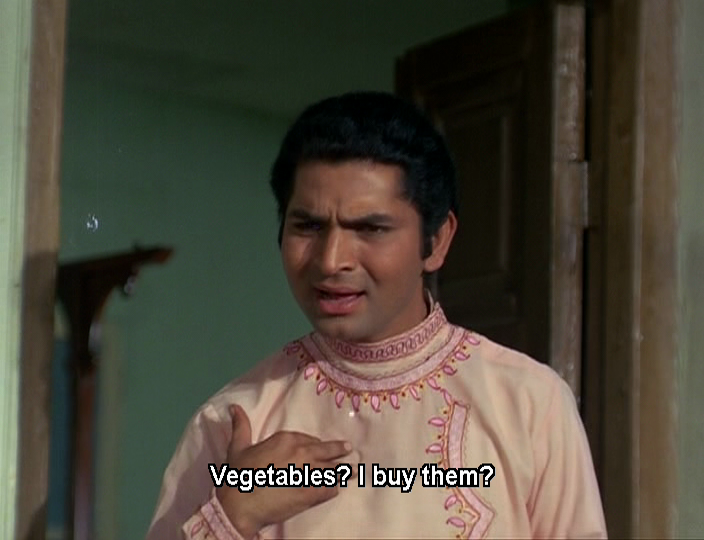 Most of the films I’ve seen with Rajesh Khanna have been romances, but there is something very special about those few films where he doesn’t play the typical hero. Here he has an irrepressible twinkle in his eye and such a beautiful smile as he guides the family to an actual ‘peaceful abode’. 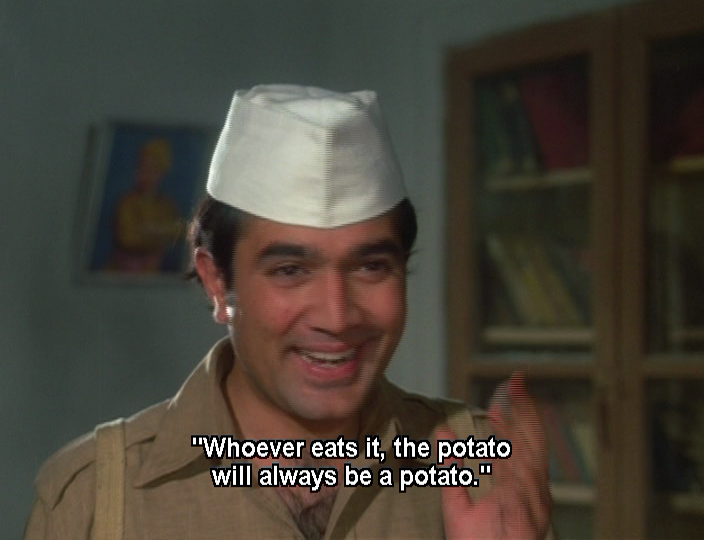 It’s a wonderful performance and Rajesh Khanna is definitely a large part of why I love this film. 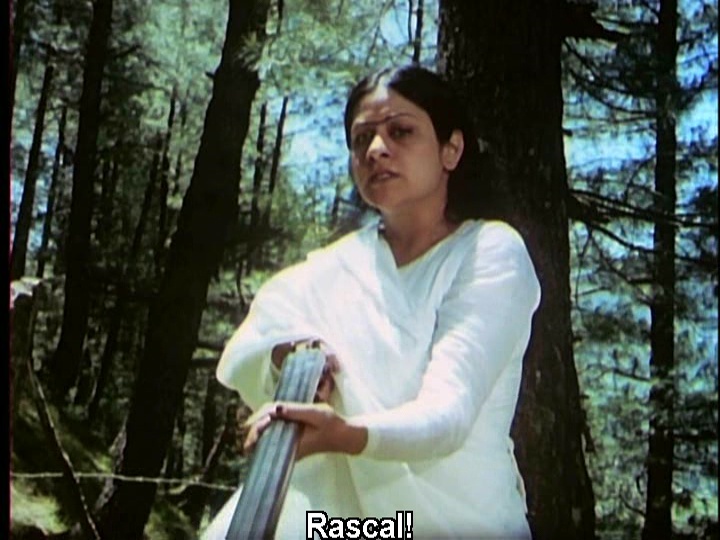 Just as amazing though is Jaya Bhaduri as she portrays shy innocence and naiveté with ease, and yet makes Krishna a normal down-to-earth person, trying to do her best with the lot she has been given. She’s sweet and natural with her grandfather, properly demure and respectful to her aunts but cheekily mischievous with her youngest uncle. It’s hard to believe that this was one of the early films in her career as she definitely holds her own with the rest of the more experienced cast. 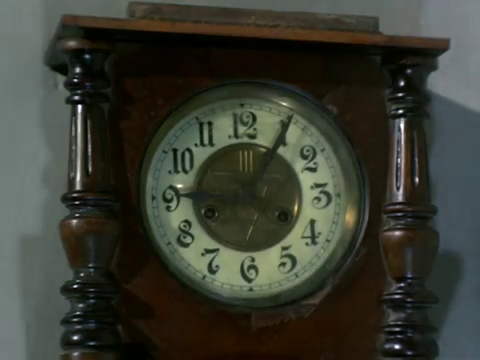 I also love the sets here which make the house look homely and lived in. 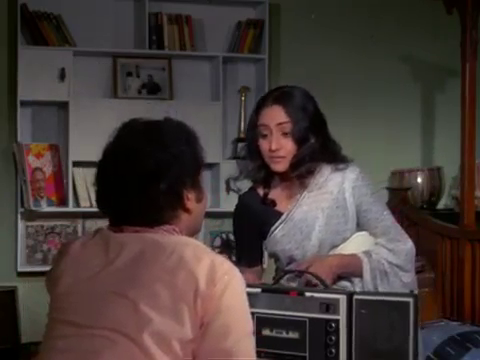 The locked case is impressive in it’s ‘look at me – I contain something valuable’ obviousness but there are also some wonderful lamps and clocks and Babbu has some very cool looking records on his shelf. The only let-down in the film for me is the end, which seems a little too contrived as Raghu creates a rather unsophisticated solution to the final family problems. 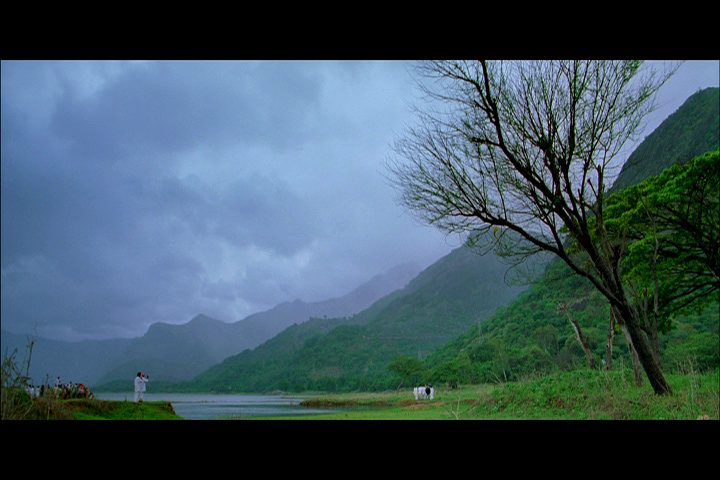 I feel it’s a little too simplistic considering some of the earlier scenes and the way Raghu’s character has evolved. However it’s a small quibble, particularly when the rest of the film is so enjoyable. Bawarchi is definitely recommended for those times when you want to escape into a wholesome family drama that’s guaranteed to make you smile. 4 stars.